When travelling chips or salad are often the staple side options. Most people will comment I’m going to be good and have salad or I’m going to be bad and have chips. Or I’m going to treat myself and have chips. I find both a negative way to approach food. 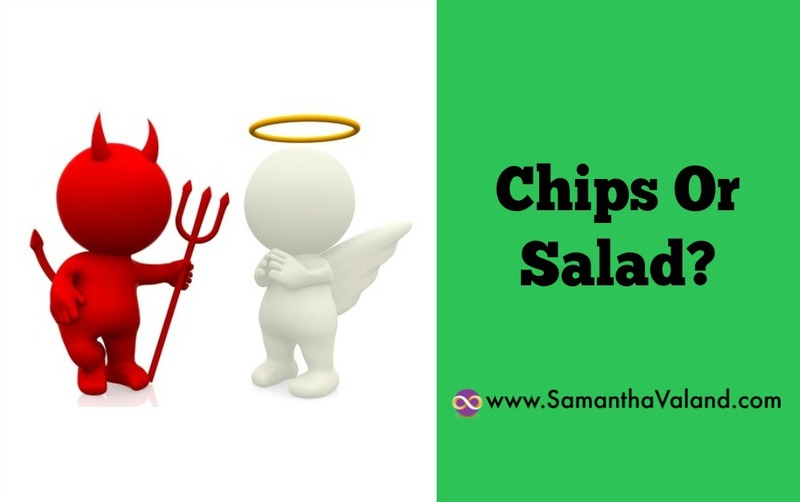 To start off we have made an assumption that the salad is healthy and has fewer calories compared to the chips which we have assumed they are unhealthy and a calorific without seeing a breakdown of the nutrients on either products. Personally I’m reluctant to eat salads from restaurants because the few restaurants that do list their compositions show that they are indeed calorific. I think the worst was a Ceaser Salad in a hotel which was 750 calories, wow. They also had a salmon fillet and roast veggies for around 400 calories. You can guess the one I chose! Not just because of the calorie content but because of the composition on the plate. The later had a good size portion of protein as well as veggies. Ceaser salad tends to be all lettuce and mayo, with little protein. It takes half an hour to eat it and you are still hungry! When travelling there are limited options so I would rather have something substantial rather than eat something that would leave me hungry in a few hours and have me looking for something else to eat. Rather than bundle food as good or bad. I categorise it as daily and occasional. Chips would definitely pop into the occasional pile. So whether I have them depends on the last time I had chips and any plans to have them in the immediate future i.e. if we had plans to eat out at the weekend. My own home made salad I would pop into a daily pile, but I wouldn’t eat them every day as variety is just as important! Restaurant salads would probably be occasional as well. Not all salads are equal and a bit of research is usually required to find out which salads taste good, are satisfying and not hugely calorific. I’m a big fan of sharing food when eating out so sharing a bowl of chips or salad is a good way of minimising risk and calories consumed! Most women I work with who complain they are overweight and don’t know why fall into this trap. They make assumptions about salads and other ‘healthy’ foods without reading the nutrition labels. They guesstimate. Get into the habit of reading labels not just for the calories. They are important but also look at the composition of your plate. Most meals I’m aiming for meat and two veg (because the carbs always look after themselves). I keep it as simple as that. What does your plate look like? Your muscle mass naturally decreases as you get older if you don’t take any action. This means you need less calories. So although eating healthily is important. Calories do matter. Making an assumption that if it’s marketed as being ‘healthy’ it has few calories will lead to an unwanted weight gain.